One thing that my trip to New Orleans taught me is that the devastation of Katrina did not wash away the spirit of this city. There is a palpable sense of change that looms over the Crescent City, but despite this, you are guaranteed to be greeted with a “Lassez le Bon Temps Roule” and a local will be happy to tell you all about their favorite musician and the ultimate locale for an Abita and a Po Boy. 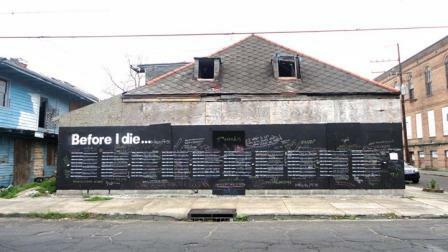 This is what I love about New Orleans. People are NICE here. 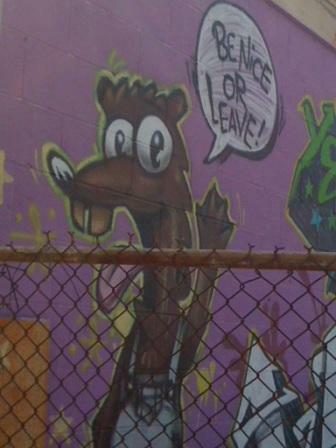 That simple fact alone propelled me into a state of Culture Shock, but the city has some incredible artists too. I learned this during a bike tour I took through the Faubourg Marigny and the Treme with the Confederacy of Cruisers. The tour guides know their New Orleans history and will lead groups through neighborhoods off the beaten path giving visitors a unique look at the architecture, culture, and spirit of New Orleans. During my ride we passed a boarded up house with one side painted in black chalkboard paint. 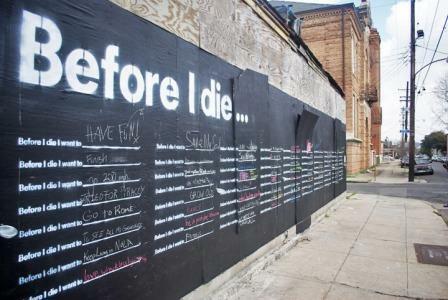 At the top of the black plywood wall a large, white, spray painted stencil says “Before I Die…”. Underneath, smaller versions of this proclamation are repeated numerous times with blank lines after each statement. 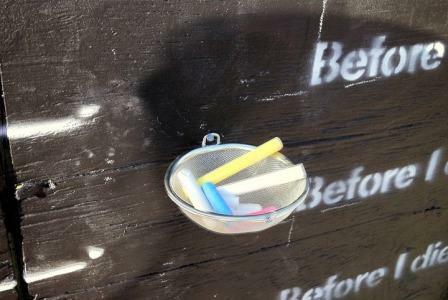 Hung along the black wall were wire dishes containing large, brightly colored pieces of chalk; people are invited to share their answers to this question. Ironically enough our group “cruised” by too fast for us to stop and discuss, but the wall prompted a conversation between me and a fellow tourist during our ride. I later found out that the piece was created by artist Candy Chang, a former Art Director for the New York Times who currently lives in New Orleans and is one of the 2011 TED Fellows. She takes elements of architecture, graphic design and urban planning and weaves them together to create installations that inspire personal reflection and spark thoughtful communication among residents in their communities. Her projects are a fascinating fusion between urban planning and artistic expression. My favorite New Orleans band is the Rebirth Jazz Band, a perfect metaphor for the city’s psyche. The city continues to cling onto its rich traditions while also trying to figure out who they are going to grow into in a post Katrina environment. There have certainly been growing pains, but the spirit and graciousness of the city remain.